Allergenic extract is intended for use by, or under the guidance of, physicians who are experienced in the administration of allergenic extracts for diagnosis and/or immunotherapy and the emergency care of anaphylaxis. This extract is not directly interchangeable with other allergenic extracts. The initial dose must be based on skin testing as described in the â€œDOSAGE AND ADMINISTRATIONâ€ section of this insert. Patients switching from other types of extracts to Antigen Laboratoriesâ€™ allergenic extracts should be started as if they were undergoing treatment for the first time. Patients being switched from one lot of extract to another from the same manufacturer should have the dose reduced by 75%. Severe systemic reactions may occur with all allergenic extracts. In certain individuals, especially in steroid-dependent/unstable asthmatics, these life-threatening reactions may result in death. Patients should be observed for at least 20 minutes following allergenic extract injections. Treatment and emergency measures, as well as personnel trained in their use, must be available in the event of a life-threatening reaction. Sensitive patients may experience severe anaphylactic reactions resulting in respiratory obstruction, shock, coma and/or death. Report serious adverse events to MedWatch, 5600 Fishers Lane, Rockville, MD 20852-9787, phone 1-800-FDA-1088. This product should not be injected intravenously. Deep subcutaneous routes have proven to be safe. See the â€œWARNINGSâ€, â€œPRECAUTIONSâ€, â€œADVERSE REACTIONSâ€ and â€œOVERDOSAGEâ€ sections. Patients receiving beta-blockers may not be responsive to epinephrine or inhaled bronchodilators. Respiratory obstruction not responding to parenteral or inhaled bronchodilators may require theophylline, oxygen, intubation and the use of life support systems. Parenteral fluid and/or plasma expanders may be utilized for treatment of shock. Adrenocorticosteroids may be administered parenterally or intravenously. Refer to â€œWARNINGSâ€, â€œPRECAUTIONSâ€ and â€œADVERSE REACTIONSâ€ sections below. 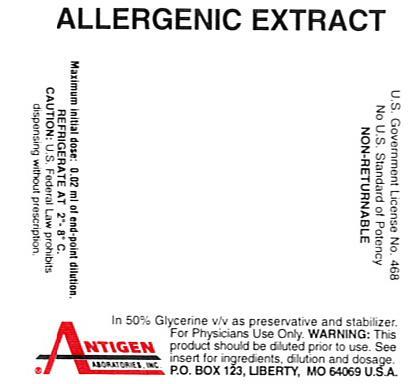 Antigen Laboratoriesâ€™ allergenic extracts are manufactured from source material listed on the vial label. Lower concentrations (e.g. 1:50, 1:33, etc.) may be prepared either by dilution from a more concentrated stock or by direct extraction. The extract is a sterile solution containing extractables of source materials obtained from biological collecting and/or processing firms and Antigen Laboratories. All source materials are inspected by Antigen Laboratoriesâ€™ technical personnel in accordance with 21 CFR 680.1 (b) (1). The route of administration for immunotherapy is subcutaneous. The routes of administration for diagnostic purposes are intradermal or prick-puncture of the skin. Active allergens are described by common and scientific name on the stock concentrate container label or on last page of this circular. Food allergenic extracts may be manufactured on a weight/volume (w/v) or volume/volume (v/v) basis. Food extracts made from dried raw material are extracted at 2-10% (1:50-1:10 w/v ratio) in extracting fluid containing 50% glycerine. Slurries of juicy fruits or vegetables (prepared with a minimum amount of water for injection) are combined with an equal volume of glycerine for a ration of 1:1 volume/volume (v/v). Sodium chloride and sodium bicarbonate are added to the slurry and glycerine mixture. Fresh egg white extract is prepared by adding one part raw egg white to nine parts of extracting fluid (1:9 v/v). Antigen E is considered the most important allergen of Short Ragweed pollen and is used for the standardization of Short Ragweed allergenic extracts. Stock mixtures containing Short Ragweed are analyzed for Antigen E content by radial immunodiffusion using Center for Biologics Evaluation and Research (CBER) references and anti-serum. Antigen E content expressed as units of Antigen E per milliliter (U/ml) is printed on container label. Allergenic extract is used for diagnostic testing and for the treatment (immunotherapy) of patients whose histories indicate that upon natural exposure to the allergen, they experience allergic symptoms. Confirmation is determined by skin testing. Diagnostic use of allergenic extracts usually begins with direct skin testing. This product is not intended for treatment of patients who do not manifest immediate hypersensitivity reactions to the allergenic extract following skin testing. Do not administer in the presence of diseases characterized by bleeding diathesis. Individuals with autoimmune disease may be at risk of exacerbating symptoms of the underlying disease, possibly due to routine immunization. Patients who have experienced a recent myocardial infarction may not be tolerant of immunotherapy. Children with nephrotic syndrome probably should not receive injections due to immunization causing exacerbation of nephrotic disease. Refer to boxed â€œWARNINGSâ€, â€œPRECAUTIONSâ€, â€œADVERSE REACTIONSâ€ and â€œOVERDOSAGEâ€ sections for additional information on serious adverse reactions and steps to be taken, if any occur. Extreme caution is necessary when using diagnostic skin tests or injection treatment in highly sensitive patients who have experienced severe symptoms or anaphylaxis by natural exposure, or during previous skin testing or treatment. IN THESE CASES THE POTENCY FOR SKIN TESTS AND THE ESCALATION OF THE TREATMENT DOSE MUST BE ADJUSTED TO THE PATIENTâ€™S SENSITIVITY AND TOLERANCE. Benefit versus risk needs to be evaluated in steroid dependent asthmatics, patients with unstable asthma or patients with underlying cardiovascular disease. Proper measurement of dose and caution in making injection will minimize reactions. Adverse reactions to allergenic extracts are usually apparent within 20-30 minutes following injection of immunotherapy. 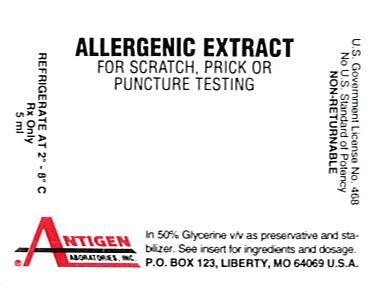 Extract should be temporarily withheld or dosage reduced in case of any of the following conditions: 1) flu or other infection with fever; 2) exposure to excessive amounts of allergen prior to injection; 3) rhinitis and/or asthma exhibiting severe symptoms; 4) adverse reaction to previous injection until cause of reaction has been evaluated by physician supervising patientâ€™s immunotherapy program. Immunotherapy must be given under physicianâ€™s supervision. Sterile solutions, vials, syringes, etc. must be used. Aseptic technique must be observed in making dilutions from stock concentrates. The usual precautions in administering allergenic extracts are necessary, refer to boxed WARNINGS and â€œWARNINGSâ€ section. Sterile syringe and needle must be used for each individual patient to prevent transmission of serum hepatitis, Human Immunodeficiency Virus (HIV) and other infectious agents. Epinephrine 1:1000 should be available. Refer to â€œOVERDOSAGEâ€ section for description of treatment for anaphylactic reactions. Patient should remain under observation of a nurse, physician, or personnel trained in emergency measures for at least 20 minutes following immunotherapy injection. Patient must be instructed to report any adverse reactions that occur within 24 hours after injection. Possible adverse reactions include unusual swelling and/or tenderness at injection site, rhinorrhea, sneezing, coughing, wheezing, shortness of breath, nausea, dizziness, or faintness. Immediate medical attention must be sought for reactions that occur during or after leaving physicianâ€™s office. Long term studies in animals have not been conducted with allergenic extract to determine their potential for carcinogenicity, mutagenicity or impairment of fertility. It is not known whether allergenic extracts are excreted in human milk. Because many drugs are excreted in human milk, caution should be exercised when allergenic extracts are administered to a nursing woman. Adverse reactions include, but are not limited to urticaria; itching; edema of extremities; respiratory wheezing or asthma; dyspnea; cyanosis; tachycardia; lacrimation; marked perspiration; flushing of face, neck or upper chest; mild persistent clearing of throat; hacking cough or persistent sneezing. A mild burning immediately after injection is expected; this usually subsides in 10-20 seconds. Prolonged pain or pain radiating up arm is usually the result of intramuscular injection, making this injection route undesirable. Subcutaneous injection is the recommended route. Small amounts of erythema and swelling at the site of injection are common. Reactions should not be considered significant unless they persist for at least 24 hours or exceed 50 mm in diameter. Larger local reactions are not only uncomfortable, but indicate the possibility of a severe systemic reaction if dosage is increased. In such cases dosage should be reduced to the last level not causing reaction and maintained for two or three treatments before cautiously increasing. Large, persistent local reactions or minor exacerbations of the patientâ€™s allergic symptoms may be treated by local cold applications and/or use of oral antihistamines. Careful attention to dosage and administration limit such reactions. Allergenic extracts are highly potent to sensitive individuals and OVERDOSE could result in anaphylactic symptoms. Therefore, it is imperative that physicians administering allergenic extracts understand and prepare for treatment of severe reactions. Refer to â€œOVERDOSAGEâ€ section. Refer to â€œWARNINGSâ€, â€œPRECAUTIONSâ€ and â€œADVERSE REACTIONSâ€ sections for signs and symptoms of an overdose. If a systemic or anaphylactic reaction does occur, apply tourniquet above the site of allergenic extract injection and inject intramuscularly or subcutaneously 0.3 to 0.5 ml of 1:1000 Epinephrine-hydrochloride into the opposite arm or gluteal area. Repeat dose in 5-10 minutes if necessary. Loosen tourniquet briefly at 5 minute intervals to prevent circulatory impairment. Discontinue use of the tourniquet after ½ hour. The epinephrine HCL 1:1000 dose for infants to 2 years is 0.05 to 0.1 ml; for children 2 to 6 years it is 0.15 ml; for children 6 to 12 years it is 0.2 ml. Symptoms of progressive anaphylaxis include airway obstruction and/or vascular collapse. After administration of epinephrine, profound shock and vasomotor collapse should be treated with intravenous fluids and possibly vasoactive drugs. Monitor airways for obstruction. Oxygen should be given by mask if indicated. Patients who have been taking beta-blockers may be unresponsive to epinephrine. Epinephrine or beta-adrenergic drugs (Alupent) may be ineffective. These drugs should be administered even though a beta-blocker may have been taken. The following treatment will be effective whether or not patient is taking a beta-blocker: Aminophylline IV, slow push or drip, Atrovent (Ipratropium bromide) Inhaler, 3 inhalations repeated, Atropine, 0.4 mg/ml, 0.75 to 1.5 ml IM or IV, Solu-Cortef, 100-200 mg IM or IV, Solu-Medrol, 125 mg IM or IV, Glucagon, 0.5-1 mg IM or IV, Benadryl, 50 mg IM or IV, Cimetidine, 300 mg IM or IV, Oxygen via ambu bag. Refer to â€œSTORAGEâ€ section for proper storage condition for allergenic extract. Parenteral drug products should be inspected visually for particulate matter and discoloration prior to administration, whenever solution and container permit. Some allergenic extracts naturally precipitate. Physicians undertaking immunotherapy should be concerned with patientâ€™s degree of sensitivity. The initial dilution of allergenic extract, starting dose, and progression of dosage must be carefully determined on the basis of the patientâ€™s history and results of skin tests. Strongly positive skin tests may be risk factors for systemic reactions. Less aggressive immunotherapy schedules may be indicated for such patients. PRICK-PUNCTURE TESTING: To identify highly sensitive individuals and as a safety precaution, it is recommended that a prick-puncture test using a drop of the extract concentrate be performed prior to initiating very dilute intradermal testing. Prick-puncture testing is performed by placing a drop of extract concentrate on the skin and puncturing the skin through the drop with a small needle such as a bifurcated vaccinating needle. The most satisfactory sites on the back for skin testing are from the posterior axillary fold to 2.5 cm from the spinal column, and from the top of the scapula to the lower rib margins. The best areas on the arms are the volar surfaces from the axilla to 2.5 or 5 cm above the wrist, skipping the anticubital space. A positive reaction is approximately 10-15 mm erythema with 2.5 mm wheal. Smaller, less conclusive reactions may be considered positive in conjunction with a definitive history of symptoms on exposure to the allergen. The more sensitive the patient the higher the probability that he/she will have symptoms related to the exposure of the offending allergen. Hence, the importance of a good patient history. Less sensitive individuals can be tested intradermally with an appropriately diluted extract. A positive control using histamine phosphate identifies patients whose skin may not react due to medications, metabolic or other reasons. A negative control (50% glycerine for prick-puncture testing) would exclude false-positive reactions due to ingredients in diluent or patients who have dermatographism. INTRADERMAL TESTING-SKIN ENDPOINT TITRATION: The allergenic extracts to which the patient is sensitive, the patientâ€™s degree of sensitivity and the dose of allergen to be used in immunotherapy can be determined through the use of intracutaneous skin tests involving progressive five-fold dilutions of allergenic extracts. Intracutaneously inject 0.01 to 0.02 ml of the test allergen to form a 4 mm diameter superficial skin wheal. For patients demonstrating a negative or weakly reactive prick-puncture skin test, an initial screening dilution of 1:12,500 w/v is safe. For patients demonstrating a positive prick-puncture skin test, an initial screening dilution of 1:312,500 w/v is safe. (See â€œSerial Dilution Titration Test Dilutionsâ€ chart below.) When a sequence of five-fold or ten-fold dilutions of an allergen are injected, the endpoint is determined by noting the dilution that first produces a wheal and erythema (15 minutes after injection) that is 2 mm larger than wheals with erythema produced by weaker, non-reacting dilutions (5 mm negative wheal). The endpoint dilution is used as a starting dose concentration for immunotherapy. An endpoint dose of 0.15 ml is a safe initial dose to be followed by escalation to the optimal maximum tolerated dose for each individual. Injections should never be given intravenously. A 5/8 inch, 25 gauge needle on a sterile syringe will allow deep subcutaneous injection. Dosages progressively increase according to the tolerance of the patient at intervals of one to seven days until, (1) the patient achieves relief from symptoms, (2) induration at the site of injection is no larger than 50 mm in 36 to 48 hours, (3) a maintenance dose is reached (the largest dose tolerated by the patient that relieves symptoms without undesirable local or systemic reactions). This maintenance dose may be continued at regular intervals perennially. It may be necessary to adjust the progression of dosage downward to avoid local and constitutional reactions. The usual duration of treatment has not been established. A period of two or three years on immunotherapy constitutes an average minimum course of treatment. Stock concentrates are available in concentrations of 2-10% or weight/volume (w/v) of 1:50, 1:33, 1:20 or 1:10. Some juicy or liquid foods are available at 1:1 volume/volume (v/v) extraction ratio. Fresh egg white extract is available at 1:9 v/v extraction ratio. Antigen E content of ragweed mixtures ranges from 46-166 U/ml for Ragweed Mixture (Short/Giant/Western/Southern Ragweed), 47-239 U/ml for Short/Giant/Western Ragweed Mixture, and 106-256 U/ml for Short/Giant Ragweed Mixture. Refer to container label for actual Antigen E content. Extract (stock concentrate) is supplied in 10, 30 and 50 ml containers. Extracts in 5 ml dropper bottles are available for prick-puncture testing. To insure maximum potency for the entire dating period, all stock concentrates contain 50% glycerine v/v. Store all stock concentrates and dilutions at 2-8° C. Keep at this temperature during office use. The expiration date of the allergenic extracts is listed on the container label. Dilutions of the allergenic extracts containing less than 50% glycerine are less stable. If loss of potency is suspected, potency can be checked using side by side skin testing with freshly prepared dilutions of equal concentration on individuals with known sensitivity to the allergen. 1. Bousquet, Jean: â€œIn vivo methods for study of allergy: Skin testsâ€ Third Edition, Allergy Principles and Practice, C.V. Mosby Co., Vol. I, Chap. 19, pp 419-436, 1988. 2. Long, W.F., Taylor, R.J., Wagner, C.J., et al. : Skin test suppression by antihistamines and the development of subsensitivity, J. Allergy Clin. Immunol., pp. 76-113, 1985. 3. Holgate, S.T., Robinson, C., Church, Mike: Mediators of Immediate Hypersensitivity, Third Edition, Allergy Principles and Practice, C.V. Mosby Co., Vol. I and II, pp 135-163, 1988. 4. Wasserman, S., Marquart, D.: Anaphylaxis, Third Edition, Allergy Principles and Practice, C.V. Mosby Co., Vol. 1, Chap. 58, pp. 1365-1376, 1988. 5. Reid, Michael J., Lockey, Richard F., Turkeltaub M.D., Paul C., Platts-Mills, Thomas. â€œSurvey of Fatalities from Skin Testing and Immunotherapy 1985-1989â€, Journal of Allergy and Clinical Immunology, Vol. 92, No. 1, pp. 6-15, 1993. 6. Matthews, K., et al: Rhinitis, Asthma and Other Allergic Diseases. NIAID Task Force Report, U.S. Dept. HEW, NIH Publication No. 79-387, Chapter 4, pp. 213-217, May 1979. 7. Ishizaka, K.: Control of IgE Synthesis, Third Edition, Allergy Principles and Practices, Vol. I, Chap. 4, p. 52, edited by Middleton et al. 8. Nelson, H.S. : â€œThe Effect of Preservatives and Dilution on the Deterioration of Russian Thistle (Salsola pestifer), a pollen extract.â€ The Journal of Allergy and Clinical Immunology, Vol. 63, No. 6, pp. 417-425, June 1979. 9. Seebohm, P.M., et al: Panel on Review of Allergenic Extracts, Final Report, Food and Drug Administration, March 13, 1981, pp. 84-86. 10. Rocklin, R.E., Sheffer, A.L., Grainader, D.K. and Melmon, K.: â€œGeneration of antigen-specific suppressor cells during allergy desensitizationâ€, New England Journal of Medicine, 302, May 29, 1980, pp. 1213-1219. 11. Seebohm, P.M., et al: Panel on Review of Allergenic Extracts, Final Report, Food and Drug Administration, March 13, 1981, pp 9-48. 12. Stevens, E.: Cutaneous Tests, Regulatory Control and Standardization of Allergenic Extracts, First International Paul-Ehrlich Seminar, May 20-22, 1979, Frankfurt, Germany, pp. 133-138. 13. Van Metre, T., Adkinson, N., Amodio, F., Lichtenstein, L., Mardinay, M., Norman, P., Rosenberg, G., Sobotka, A., Valentine, M.: â€œA Comparative Study of the Effectiveness of the Rinkel Method and the Current Standard Method of Immunology for Ragweed Pollen Hay Fever,â€œ The Journal of Clinical Allergy and Immunology, Vol. 66, No. 6, p. 511, December 1980. 14. Wasserman, S.: The Mast Cell and the Inflammatory Response. The Mast Cell-its role in Health and disease. Edited by J. Pepys & A.M. Edwards, Proceedings of an International Symposium, Davos, Switzerland, Pitman Medical Publishing Co., 1979, pp. 9-20. 15. Perelmutter, L.: IgE Regulation During Immunotherapy of Allergic Diseases. Annals of Allergy, Vol. 57, August 1986. 16. Bullock, J., Frick, O.: Mite Sensitivity in House Dust Allergic Children, Am. J. Dis. Child., pp. 123-222, 1972. 17. Willoughby, J.W. : Inhalant Allergy Immunotherapy with Standardized and Nonstandardized Allergenic Extracts, American Academy of Otolaryngology-Head and Neck Surgery: Instructional Courses, Vol. 1, Chapter 15, C.V. Mosby Co., St. Louis, Missouri, September 1988.